When it comes to reinventing the wing, a team comprised of MIT and NASA engineers are doing more than just playing with new designs and materials, they’re… no, sorry, they’re playing with new designs and materials. In all fairness, the idea of creating a morphing wing comes from the early days of flight, but the Wright brothers didn’t have little robots or carbon fiber to work with. In one of the most successful attempts to date to replace the wood and canvas of the Wright brothers’ wing warping designs, MIT and NASA have worked together using modern materials and they may have a viable flight solution. Previous attempts to duplicate the morphing wing design utilized materials that were simply too heavy for practical flight, the new designs, however, appears to match the aerodynamic properties of a wing ten times the weight. Let’s get back to the beginning here, let’s understand some basics of what wings are all about, then we can appreciate the changes. A conventional wing, like is equipped on almost every aircraft most of us have been on, includes a large flat surface, then has moving flaps on the back edge, and infrequently on the front edge as well. These flaps change the overall airflow over and under the wings, changing their flight characteristics dramatically. The wood and canvas wings that the team from MIT and NASA are emulating actually twisted and changed shape to manage how they cut through the air, and that is where we pick up today. Instead of using pulleys and cables, the team is using carbon fiber reinforced polymer materials, their wing design is made of overlapping strips, lightweight feather like sub-segments. The inner framework is where the carbon fiber comes in, creating a tunable and actively deformable modular system of ‘blocks’ referred to as digital materials. Basically, a framework that is flexible wrapped inside of a layer of also flexible skin. The team put together a mechanically controlled version of the wings and affixed them to an unmanned drone. The test pilot that got to fly reportedly was impressed, stating that the wings were capable enough to offer some acrobatics in the air. Now to get passed the mechanically operated aspect and get into the electrically stimulated response that should control the structure. Of course, you came here for the robots. Using these same materials, the team has also created a few small robots that are designed to help in the construction and maintenance of the wings. Particularly handy on the inside of the wing where one cannot simply put their arm. Other applications are in mind for the robots, of course, as they are flexible and strong. But the robots got to sit this one out, the prototype wings were built by hand. 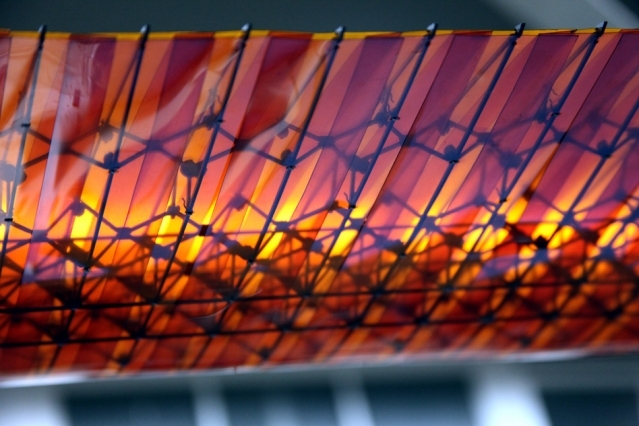 Beyond the aircraft, morphing wings have potential for application on things like wind turbines, bridges, space structures and more. We are very excited to see where this goes next, if nothing else, these little bots could do some roof repairs and clean the gutters on the hard to reach places of the house. What do you say, is it time to re-reinvent the wing?